All you need to know about the City Museum | the every things. Where to even start with the City Museum. You want to carve out at least 5 hours for your visit, but you can easily spend the entire day here. If your wondering if this is age appropriate for your bunch. I, personally, think age 7+ is the best ages to go as a family though. However, you will see below there is certain areas of the Museum that are for ages under 6. This museum is not your typical museum. The art is there to be climbed on..in..around. Let me preface this all by saying, if you are what they call a "helicopter parent" this isn't the place for your family. I don't mean this as a negative thing, but there will be several times during your visit you will not know where your child is. They will go in one tunnel & it may be 5 minutes before you see them again. You can try to find the "out" of the tunnel they went in, but sometimes it can be impossible. In the caves & tunnels they can get tight. Even the smallest & slimmest of parents are not going to be able to fit, so following in after them isn't always an option either. I will say it is worth letting them just go. -Meeting place - Before heading in, talk with your kiddos. Let them know it will be dark & mommy & daddy won't be able to see them at all times. Either, find a meeting place in the museum to meet at if someone gets lost or let them know to stay exactly where they are & not to move so you can find them. We didn't have any problems but we saw a couple lost kiddos. - Phone Number - We wrote our phone numbers on both girls wrist, these tattoos we love, but the wristbands from the museum also have a spot to write it down in case they get lost. -Head Lamps - I know this sounds silly, but as soon as you step into the caves you will see why. Some parts are completely pitch black. A flash light will work, but it will be much easier for your kiddos having it on their head as they are climbing around. - Knee Pads - I actually left these at home on accident but I highly recommend taking knee pads for your kiddos. Both my girls were very sore the night of & I know had I remembered it would have saved them some! - Clothing - Dress comfortably. Think gym clothes. I wore leggings, a loose tshirt & chambray top. The girls wore leggings & t shirts with a jacket. Brandon was comfortable in jeans & a tshirt. You want to make sure you are comfy & your clothes aren't constricting what you can do! - Let go - Get down on your knees, go down the slide(there is over 30 of them!). Have fun with your kids while acting like a kid again your self! The caves were my girls favorite part aside from the slides. & there is ALOT of slides. 2 of which are a 5 story slide & a 10 story slide! & boy are they so much fun!! You can not bring in any food, but there is food on site. It's average food for a museum, & they also have fun slushies that my girls enjoyed getting. With everything there is to do inside, there is just as much outside! A castle, 2 airplanes, draw bridges...seriously..
As I mentioned above, you certainly can bring children any age here. I just personally feel it would be tough for toddler as you really can't keep an eye on them like they would need. There are a few areas for ages under 6! I was also happy to see they had a designated nursing room as well! 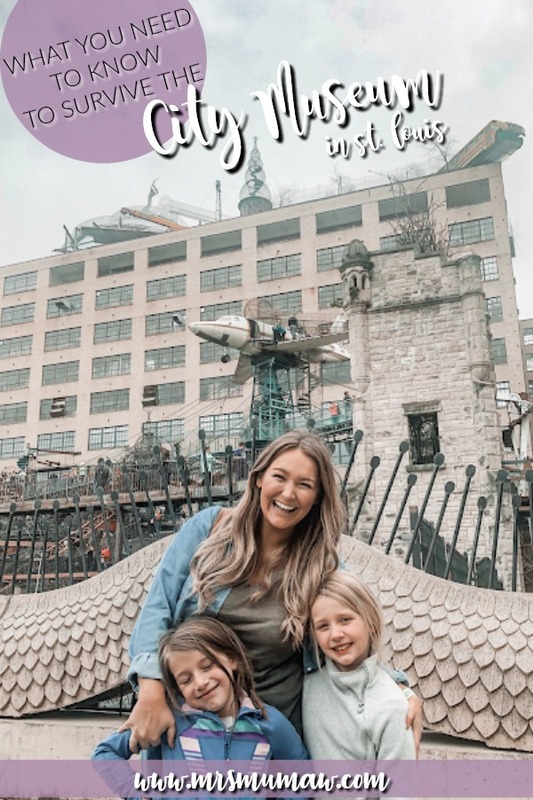 If you can get past the little bit of unknown of the whereabouts of you kiddos for several minutes, I really, truly think every family should go to the City Museum! You will leave sore, & exhausted but is so, so worth it! This post contains affiliate links. Which means I make a very small commission on any products you buy through my links, at no additional cost to you. Thank You so much for supporting my family. View my full disclosure policy for more information.